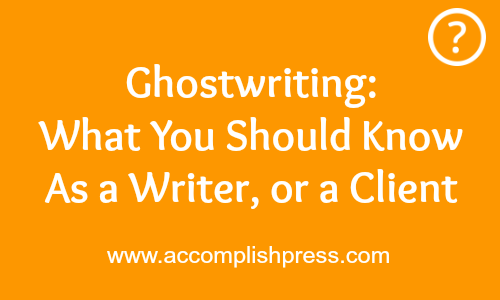 For the next few weeks here at Accomplish Press, we are focusing on the topic of Ghostwriting. There is a lot of misunderstanding about what ghostwriting is, what ghostwriters do exactly, how the agreements are drawn up, how to find a ghostwriter, and so on. To help us understand it better, we have four featured Q & A sessions with four different ghostwriters. Every week, we will ask them about their work, and their experiences in this particular writing niche. 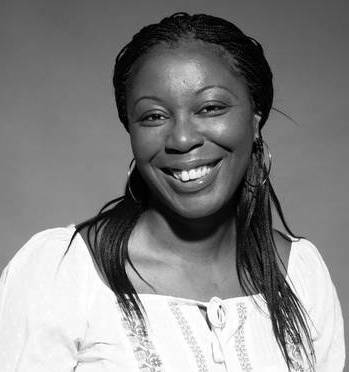 This week we’re featuring Abidemi Sanusi. What exactly is Ghostwriting? How did you get into this niche? Ghostwriting is when someone takes on the writing responsibility for another person. Like most ghostwriters I fell into genre quite by accident. I got an email from my literary agent; he wanted to know if I would be interested in writing the life story of a bishop in Nigeria who had survived two assassination attempts. Well, I considered myself a purely fiction writer and didn’t know anything about writing biographies. My agent wasn’t deterred; he said he knew I would do a great job, being that I was Nigerian, had worked in human rights and was an experienced author. It wasn’t that the bishop couldn’t write his own biography (of course he could – he had a doctorate). But, he was an academic, and so wrote in ‘dry, scholarly style’, which they didn’t think would work well with the book. They wanted a ‘fiction writer who would bring some creativity to the project’ – another reason I was asked. With such praise ringing in my ears, I actually convinced myself that I could do the job. To do the job, I spent some time reading different kinds of biographies, making note of the authors’ styles and thematic structures. I also bought Andrew Crofts book, Ghostwriting, which is probably one of the best books on ghostwriting out there. By the time I went to Nigeria to meet the client, I was as prepared as I could ever be to take on the work. So much so, that after spending time with the bishop and his family, I somehow convinced my agent that the bishop’s wife, Gloria, had a much stronger story that would also sell better (it’s always about the sales, dahling). What skills do you need to be a ghostwriter? – As a fiction writer, I see things very much as a story; with character, plot development, story arcs etc. These skills can be applied to your ghostwriting project, but you have to be careful not to get carried away with the writing technicalities when you’re interviewing your subject, after all, it is their life you’re writing about. That is why you’ll need recording material. I use a Dictaphone, my iPhone and also do video interviews. I also use a storyboard to help me map out the book and help keep the writing focussed. (b) You need interviewing skills. You will need to be patient and also pray for a communicative client. Make sure you set a schedule for the initial interviews and ensure your client understands why it is important to meet this schedule. If you don’t have a schedule, you will never interview the subject and the book will never be written. Work, work, work on your interviewing skills. The more information you get from the client, the easier it will be for you in the long run. What is the pay structure like? – Many people think ghostwriting is lucrative and it can be – for professionals. I know people who have been paid £5K and I know those who have been paid £20K for projects. It depends on the complexity of the subject matter, the writer’s experience and to a certain extent, the client’s budget. What rights do you have over the work? Is it different from other ‘write-to-hire’ jobs? –I don’t usually retain any rights as a ghostwriter. As far as I am concerned, I did the work, got paid and that’s the end of it. Do you have to sign a confidentiality clause when you take on the work?- I have done and most ghostwriters do. But even then, you’ll usually find ghostwriters being thanked in small text in the introduction. Who are the people most likely to be your clients? How do you find them? – I got my ghostwriting gigs mostly through my literary agent. I do get approached by people (a lot) and to date, I’ve only taken a solo project, which was definitely my last. Those ghostwriting gigs made me realise that my first and only love is fiction, so I’ve gone back to doing that. Do you need to do a lot of research in your work for other people? – Yes. Because, you want to tell a compelling story. You cannot skimp on the research. It is absolutely vital. Do you find it easier or harder to write for others as opposed to writing your own work? – For me, the most important thing is doing a good job. They’re paying you, so you want them to be happy. At the same time, you really need to manage their expectations. Be clear: No, I don’t think it will win the Nobel Prize, but I will work damn hard to make it a compelling read. Do you write fiction or non-fiction for your clients? Which do you prefer? – I wrote non-fiction, memoirs. Do you find it easier to keep an emotional distance from the work? – Yes. How do you feel when the work gets published and becomes successful, but you can’t claim any credit for it? – I just think I’ve done a good job that I got paid for. But then again, I’m credited as the author for some books. How do you manage your client’s expectations? – Have an iron-clad agreement. Be clear that you’re a writer, not an editor. So when you complete the manuscript, they’ll still need to source an editor, proofreader and also get it published. Any advice for writers who may be considering this niche? – Don’t think it’s ‘easy money’. If you’ve never written a book before or are emotionally involved with the subject matter in some way, perhaps you shouldn’t do it.